In the Railsimroutes.net Miscellaneous section, you can find various other information or downloads, which don't fit neatly into other projects sections, or which don't even necessarily involve train simulation or railways. This section might be expanded over time. 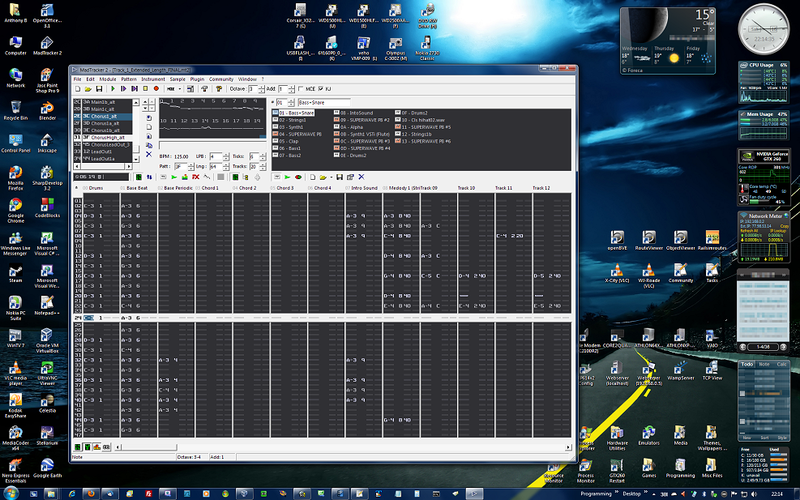 A part-time hobby which I picked up again after many years, aside from railway simulation and openBVE development, is composing tracker music. I found a good use for a couple of these tracks in my openBVE/Cross City-South/Watford Junction to Rugby preview videos which have been popular on YouTube. Well, the visuals and train sounds were popular, anyway. The software I use is MadTracker 2, and you can download some higher quality Ogg Vorbis versions of the soundtracks featured in my YouTube videos below. Soundtrack to "Watford Junction to Rugby Preview 1 (BVE Track Viewer)", composed in 2006-2007. This was my first attempt with MadTracker, and the first piece I'd composed in over a decade. It was originally inspired by the mystery and wonder of nature, the cosmos, and the mind, but the beat also conveyed a feeling of perseverance, which made it ideal for the aforementioned video preview, as so much work had gone into the route. Feedback regarding this track has been favourable for the most part, and I'm particularly happy with the second half. Soundtrack to "openBVE - Watford Junction to Rugby Preview 2", composed in 2008. This piece was originally intended solely as an intro theme for a commercial product, but my delight with Watford Junction to Rugby running so well in openBVE after my frustration with BVE 4, meant that I took the piece and heavily rewrote and expanded it for the aforementioned video preview. People either seem to love or hate this track, and personally I'm happier with second half (is there a pattern emerging here? ).